Find answers to many commonly asked questions about Venta Airwashers, as well as air cleaning and humidifying in general. If your question is not listed below, our customer support team will be happy to help you at any time. HOW DOES THE VENTA AIRWASHER HUMIDIFY? The Venta Airwasher operates by the process of Cold Evaporation technology, so you will not see any white residue, vapors, or mists. The Disc Stack rotates in the water creating a surface area over 45 square feet (LW45). When dry air meets the surface area of the Disc Stack, the water evaporates and is sent out into the room. By using the Cold Evaporation process, any excess humidity can be virtually ruled out. HOW DOES THE VENTA AIRWASHER PURIFY? Airborne particles, such as dust, pollen, and smoke are drawn in and passed over the rotating Disc Stack. The particles adhere to the wet Disc Stack and are pulled down into the water. Water evaporates; dirt and dust do not evaporate. The collected particles remain on the bottom of the Lower Housing and can be rinsed/wiped out at your convenience. WHEN IS THE BEST TIME TO RUN THE VENTA AIRWASHER? That depends on individual needs. Because the Venta Airwasher is very energy efficient, operating costs are very low even when used all the time. For consistent results, it should be run continuously. WHAT LEVEL OF HUMIDITY CAN BE EXPECTED AND HOW OFTEN SHOULD THE LOWER HOUSING BE FILLED? Under ideal conditions, a humidity level of 40-55% can be expected. Some factors affecting humidity level are heating/cooling, home insulation, the layout of the home, air circulation and amount of water in the appliance. For severely dry areas or during the first days of use, you may notice the water evaporates more quickly and/or a lower humidity level will be reached. The water level of the lower housing should be checked and topped off daily. WHERE IS THE BEST PLACE FOR THE VENTA AIRWASHER? If possible the Venta Airwasher should be placed in the center of the room, or along a wall away from windows and a heat source. When using your Venta Airwasher for multiple rooms (larger model Venta Airwashers) it should be placed centrally between rooms. Allow 18-20 inches above and on either side of the Venta Airwasher to allow air circulation. WILL OPENING OUTSIDE DOORS AND WINDOWS AFFECT THE EFFICIENCY OF THE VENTA AIRWASHER? The appliance works best in closed rooms to maintain a consistent level of humidity – just as windows and outside doors are closed when the air conditioner is running. Doors between rooms may be left open to allow for air circulation. IS IT NECESSARY TO USE THE VENTA WATER TREATMENT ADDITIVE? The Water Treatment Additive helps prevent mineral deposits from becoming hard and difficult to remove – any sediment can be easily rinsed out. In addition, the Water Treatment Additive helps improve the efficiency of the Venta Airwasher by allowing the water to sheet on the Disc Stack instead of “beading” up – allowing maximum use of every square inch of the Disc Stack. The Water Treatment Additive also helps prevent odors and improves the performance of the Venta Airwasher. WHAT HAPPENS IF THE WATER EVAPORATES WHILE THE UNIT IS STILL ON? First and foremost, the Venta Airwasher is only humidifying and purifying when water is in the appliance. However, the Water Treatment Additive holds dirt and dust particles down on the bottom of the lower housing. When there is insufficient water in the lower housing, a red light indicator will appear and the motor of the LW 15/25/45 Airwashers will shut off automatically. 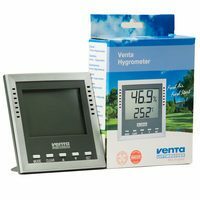 SHOULD MORE VENTA WATER TREATMENT ADDITIVE BE ADDED WHEN THE APPLIANCE HAS RUN DRY? No, because the ingredients in the Water Treatment Additive do not evaporate. Simply add fresh water to reactivate the Venta Water Treatment Additive. One dose will help keep the Venta Airwasher from scaling up with mineral deposits for 10 to 14 days. WHAT HAPPENS WHEN THE VENTA AIRWASHER HAS NOT BEEN RUN FOR AN EXTENDED PERIOD OF TIME? Simply give the appliance a general cleaning with the Venta Cleaner before using the Venta Airwasher again. Tip: Use of the Venta Airwasher Cleaner is recommended before storing the appliance for an extended period of time to remove any mineral deposits that can harden over time. You may also take advantage of Venta’s Ultrasonic Cleaning Services. WHAT IS THE BEST WAY TO CLEAN THE VENTA AIRWASHER? Every 10 to 14 days the lower housing should be rinsed/wiped out with a damp sponge. The Disc Stack should be rinsed off and/or brushed off with a soft brush or sponge. Periodically, the Venta Cleaner can be used for a thorough cleaning. At all times care should be taken to keep water away from the motor. Please see the user manual for more information. 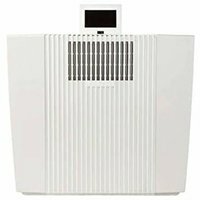 WHICH VENTA AIRWASHER IS RIGHT FOR ME? Measure your room (length X width) and choose the corresponding Venta Airwasher (see technical data in the brochure). For factors such as vaulted ceilings, rooms with fireplaces, desert conditions, higher heating temperatures, musical instruments, exotic plants or pets, we suggest going up one size to maintain ideal conditions. CAN I USE ANY ESSENTIAL OILS IN MY AIRWASHER? 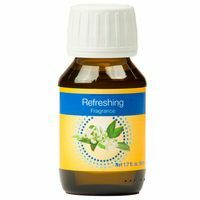 Venta has specially formulated and tested our Aromatherapy line of all-natural essential oils permitted to be used in the 4 and 5 Series Airwashers. Using a different brand will void the warranty. WHY IS THE WHEEL ON MY AIRWASHER SPINNING SLOWLY? This is the normal operation of the Disc Stack(s) in the Venta Airwasher in order to avoid vigorous splashing as well as keep the unit quiet. WHY IS MY UNIT MAKING A CLICKING NOISE? Rubber coupling is not inserted all the way into the gear. Simply remove the gear box and reinsert securely. WHY ISN’T THERE ANY MIST COMING OUT OF MY AIRWASHER? This is the normal operation of the Venta Airwasher, as it works through Cold Evaporation technology. WHAT IS THE EXPECTED WAIT TIME FOR THE ULTRASONIC CLEANINGS? It takes 2-3 weeks for the cleaning to be completed, and may take longer during the busy season due to the high demand of cleanings. We recommend that customers have units cleaned during the off-peak season to avoid long waits for Ultrasonic Cleanings. 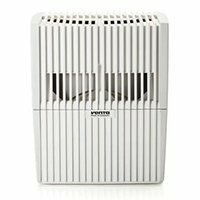 WHY IS MY VENTA AIRWASHER NOT HUMIDIFYING MY ROOM AS DESIRED? Our goal is to achieve 100% customer satisfaction. Initial product performance is largely based on room size and the overall humidity level of the contents of the room. Dry furnishings (textiles, leather, wood, books, etc.) will require a longer period of time to absorb moisture until their humidity level is increased to a satisfactory level. Therefore, we highly recommend that you take this into consideration when evaluating the performance of your product. Dry rooms can take up to one week of continuous humidification to receive an optimal humidity level. It is important that you are adding water to your unit regularly. In the event that you are dissatisfied with the performance of your product, please call us. WHERE CAN I DOWNLOAD THE VENTA APP? The Venta App is available for download to smartphones and tablets from both Google Play and the Apple App Store.